Employees simply need to show an ID badge or proof of employment in person at the Box Office to receive up to two tickets each. Seats are based on availability. Bringing fierce guitar playing and swing to gospel music, Sister Rosetta Tharpe was a legend in her time and a huge influence on Elvis Presley, Johnny Cash, Jimi Hendrix, and Ray Charles. 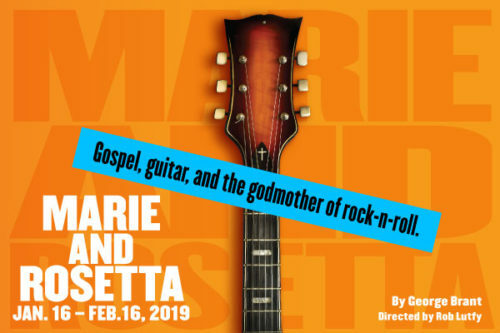 “Marie and Rosetta” chronicles her first rehearsal with a young protégée, Marie Knight, as they prepare to embark on a tour that would establish them as one of the great duos in music history. The story of letting loose, finding your voice, and freeing your soul is a soaring music-theatre experience chock full of roof-raising performances. Production runs now through Saturday, February 16. Performance schedule: Wednesday and Thursday at 7:30 p.m.; Friday at 8:00 p.m.; Saturday at 3:00 p.m. and 8:00 p.m., and Sunday at 2:00 p.m. and 7:00 p.m.